Sciblogs has joined the PressPatron platform, a crowdfunding service that makes it easy for people to make one-off or monthly payments to support content they are passionate about. We know that Sciblogs readers and those of you that comment here and in our Facebook group and on Twitter, are passionate about quality, evidence-based coverage of science-related issues. Unfortunately it is hard for mainstream media outlets to resource these types of stories, which is why we are supporting an effort to generate funding to help journalists and publishers tackle the issues that matter. 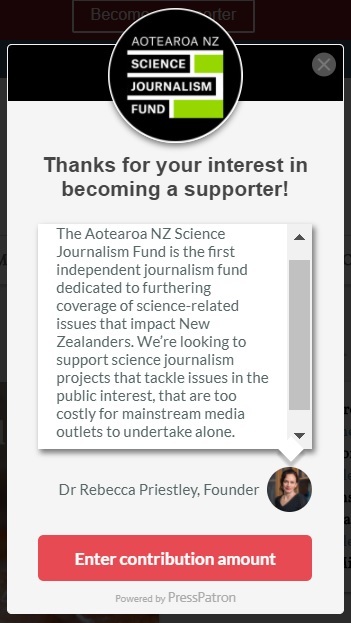 On the Sciblogs site on desktop and mobile, you will now see a red banner along the top that allows you to “become a supporter” of the recently launched Aotearoa New Zealand Science Journalism Fund, which raises money to support science-related journalism projects. The Science Journalism Fund is the brainchild of Dr Rebecca Priestley, the leader of the Science in Society programme at Victoria University and 2016 winner of the Prime Minister’s Science Communicator’s Prize. The projects need to be completed by December 31 and one is already running on the New Zealand Herald website – a collaboration between Herald science reporter Jamie Morton and SciFilms founder Damian Christie, which gets University of Auckland post-graduate students to run the ruler over the four main political parties’ conservation and environment policies. You can give as much or as little as you want to PressPatron, which only takes a 5 per cent processing fee, so most of the money actually goes into journalism projects – the Science Journalism Fund itself doesn’t use any of the money raised for administration, which is jointly handled by Dr Priestley and the Science Media Centre. 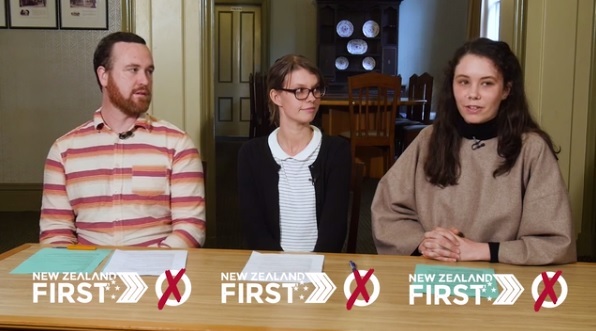 So we urge you to get behind the Aotearoa New Zealand Science Journalism Fund and to let us know what sort of science-related stories of importance to New Zealanders that you think really need closer scrutiny. Sciblogs News brings you research news from New Zealand and around the world, written by our team of contributors. Visit Scimex.org for more research news from Australasia. David Miller on Can you smell that? A hunter gatherer can!